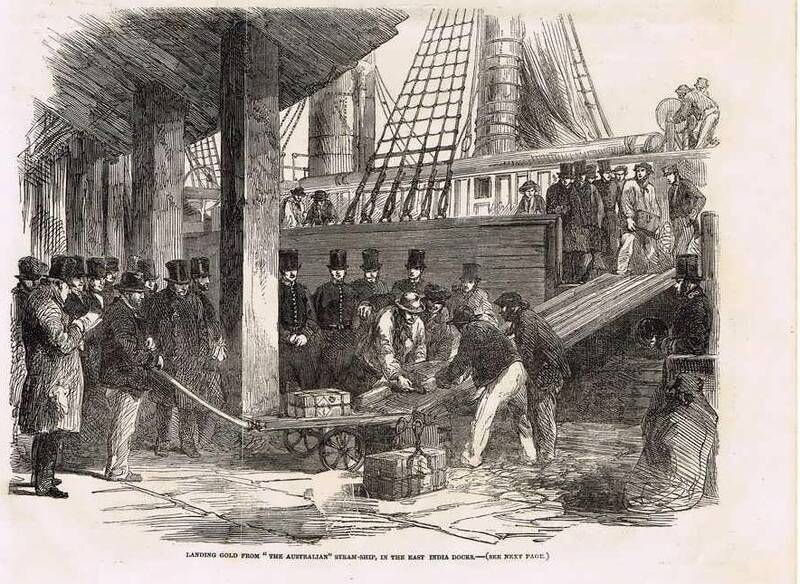 Caption: "Landing Gold from 'The Australian' steam ship, in the East India Docks". Captain Edward Goldsmith was elected by ballot to the Royal Society of Van Diemen's Land (Tasmania) on 17th December, 1851. 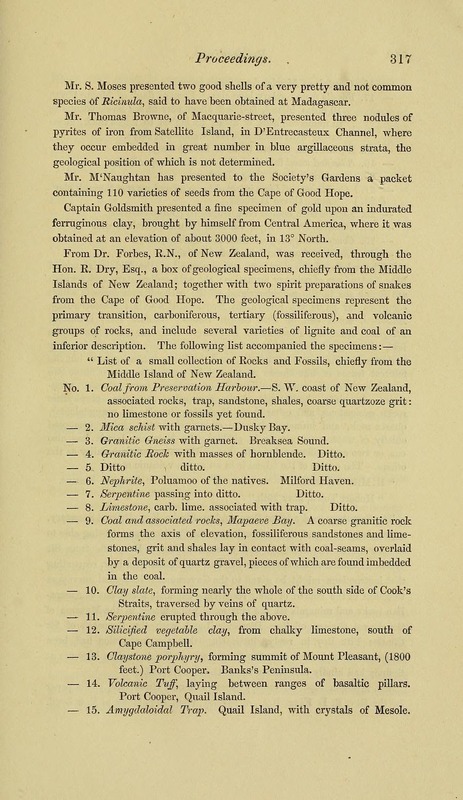 His donation of a specimen of gold from Central America was recorded by the Royal Society in January 1852.
obtained at an elevation of about 3000 feet, in 13° North. THE LARGEST VAN DIEMEN'S LAND NUGGET. - The Messrs Stevens have returned from the Fingal diggings, with a small nugget, weighing seven grains, value one shilling; it is, however, the largest lump found in this colony. If we receive the testimony of Messrs. Stevens, not only one, but hundreds of nuggets will be found - the inference is just, the deduction is clear. We believe it is just probable the diggers have been working at the fag end of the range - being about twenty miles too far to the southward. This specimen of Van Diemen's Land gold was picked up at Stanfield's Nook, about fourteen miles from Avoca. We have heard a gentleman say, whose geological acquirements are considerable, and whose judgment is not likely to be biassed by the excitement of the gold mania, that the precious metal will be found in large quantities, and probably in a few weeks, and that great changes may be anticipated in the moral and social position of this colony, from the reaction that will take place, and the stimulus that will be given to industry. Australian and New Zealand Gazette. The brig Lion, Captain Odgar, arrived from London, on Tuesday. She left in March, and is consigned to Mr. Crookes. She brings neither mail nor passengers. The Derwent, from Hobart Town, with wool and gold, arrived in London on 3rd May. Offers were made by the Gold Exploration Committee for subscriptions to encourage diggers with a reward to defray costs. THE DISCOVERY OF GOLD IN VAN DIEMEN'S LAND. A MEETING convened by the promoters of the Gold Discovery Reward was held at Mezger and Basstian's, on Thursday afternoon, at three o'clock. There was a good attendance on the occasion, and amongst those present we observed Messrs. T. D. Chapman, M. L. C, Maning, J. Foster, C. Toby, A. Orr, L. Roope, J. Degraves, R. Worley, Huxtable (2), H. Rowcroft, J. A. Thompson, J. Price, E. H. Ivey, Captain Goldsmith, Dr. Crooke. "That this meeting, taking into consideration the difficulties attendant upon inducing exploring parties to go out in search of a Workable Gold Field at their own expense: and looking to the fact that the large reward does not seem sufficient of itself to overcome this difficulty considers it desirable that a Subscription List should be opened to raise the sum of £1500, to defray the cost of fitting out a few eligible exploring parties." 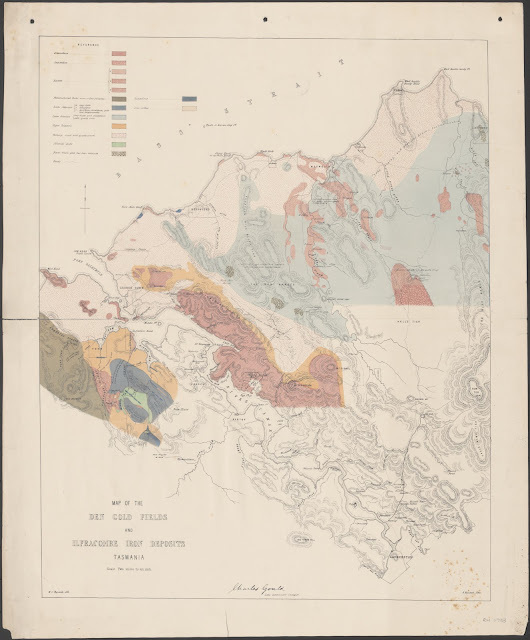 In support of this resolution, the speaker addressed the meeting at considerable length, discussing the question in all its bearings—geological, political, physical, moral. 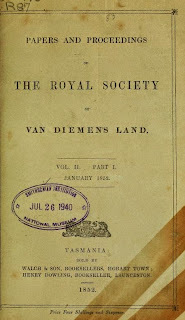 He stated that he had much pleasure in taking part in the movement at the present juncture, because he thought that the discovery of gold would advance the material, whilst it would not injure the moral interests of Van Diemen's Land. 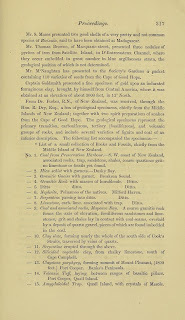 The former search for gold had failed through the superior attractions which the mines of Victoria and New South Wales presented to enterprise. Persons preferred to visit gold fields positively known, than to attempt to discover others, the existence of which, was at least uncertain. But at the same time, he had not heard doubt expressed as to the existence of a rich and workable gold field in the colony. The mercantile and trading community profited, as well as the mere gold digger, in the rich productiveness of the gold fields on the other side of the channel; and whilst therefore this colony reaped considerable advantage from the gold fields, without any of the social inconveniences which a closer neighbourhood was supposed to entail, no wonder that there was considerable apathy as to the discovery of the precious metal nearer home, and that the imperfect search for it had been fruitless. But circumstances had materially changed. The diminution in the periodical return of gold diggers originally from Van Diemen's Land arising from the attractions offered in Victoria for permanent settlement, and in some cases from the operation of the Convicts' Prevention Bill, the decrease in the importation of gold—and the depressed value of Van Diemen's Land produce at Victoria; all these circumstances contributed to diminish the advantage that had accrued to the colony from the discovery of gold in Victoria, and New South Wales, and led to increased desire for its discovery here. It was therefore an opportune moment for the attempt about to be made. He then proceeded to show by reference to the pub-lished works of Clarke, Strzelecki, and from the experience of many practical men who had visited various auriferous districts in this colony—that there were two ranges of gold-bearing rock, running due north and south, having for their culminating points, Ben Lomond and the Frenchman's Cap, towards which the search should be particularly directed. "That a committee be appointed to receive applications from persons desirous of engaging in the search, to select such applications as they may deem most desirable, and otherwise to carry out the objects of this meeting. That the following gentleman being subscribers, be requested to act as the committee:—Mr. Whitcomb. Mr. Maning, Dr. Crooke, Mr. Rowcroft, and Mr. Roope, three of them to form a quorum, and that John Dunn, Esq., Junr., be requested to act as Treasurer." After some discussion, in the course of which it was suggested that some gentlemen practically acquainted with the requirements of the case and the country to be explored, should be placed upon the committee the name of Mr. James A. Thomson (who is well acquainted with the district of country said to be auriferous; was added to the list, and in this form the resolution passed with one dissentient — Mr. Regan — who bluntly stated that he objected to Mr. Thomson. "That any one or more of the exploring parties proving successful in the search, and obtaining the Reward, shall return the amount expended by the Committee not exceeding the sum of Fifteen Hundred Pounds; to be re-paid to the Subscribers." At the suggestion of the Chairman, Mr. Roope and Dr. Crooke undertook the duty of canvassing for subscriptions. About £180 were subscribed in the room, and after the usual compliments to the chair-man, the meeting separated. Captain Edward Goldsmith's generosity in mounting appeals for public subscriptions to help women and their families to return to England when their husbands were terminally incapacitated or deceased was widely appreciated. In 1842 he raised a public subscription for charitable donations to aid Captain John Biscoe and family to return with him on board the Janet Izzat. There were probably many more instances of offers of a subsided passage on board his return voyages to London. In June and July 1854, in conjunction with the offertory funds of St Davids' and Trinity Churches, Captain Goldsmith launched an appeal to aid Mrs Baily and her six children to return to England. According to this record, her husband J. A. Baily had departed Hobart on 16th October 1852, never to be heard from again. So, in June and July, 1854, this appeal to assist Mrs Baily and her six children return to England appeared in the Hobart Courier. It concerned the disappearance of her husband, Mr J. A. Baily "for sixteen years a Clerk in the Probation Department" (i.e. in VDL/Tasmania) who had departed Hobart on board the Dart for Geelong in October 1852, bound for the Californian goldfields. The notice stated that it was almost certain he had perished with "a party of Mexicans whom he joined in a mining expedition". Source: Colonial Times (Hobart, Tas. : 1828 - 1857) Fri 7 Jul 1854 Page 2 Shipping Intelligence. Gold fever had affected the family of photographer Thomas J. Nevin as well. His father, John Nevin snr, ventured to California soon after emigrating with his wife Mary Ann Dickson and their four children, to Tasmania in 1852 when Thomas, the eldest, was just 10 years old. In this poem by John Nevin snr, published in 1868, he says he left Tasmania, which would have been in the first years after his arrival in 1852, to seek his fortune in the Californian gold mines. The life there was not for him: "the rover" returned to "Tasman's sea girt Isle", to his children (Thomas James Nevin, William John aka Jack Nevin, Mary Ann Nevin and Rebecca Jane Nevin) and his "partner" (Mary Ann Dickson) who "reclaims" him. His return was to Kangaroo Valley (now Lenah Valley, Hobart), still very much a wilderness in the northern foothills of Mount Wellington/kunanyi, where he was registered as resident schoolmaster by 1854. Photo © KLW NFC 2009 Arr. With crystal waves cheer beget. Reclaims at length the sterile plain. My cottage in the wilderness. No cottage in the wilderness. My eyes in gentle sleep shall close. Kangaroo Valley, April, 19, 1868. "Defendant said that he was the father of a large number of children, and did not know which one was referred to. (Laughter.)" "Mr. Thos Nevin was under the impression that the police should be under stricter supervision." Biography: Professional photographer Thomas James Nevin snr (1842-1923) produced large numbers of stereographs and cartes-de-visite within his commercial practice, and prisoner identification photographs on government contract. His career spanned nearly three decades, from the early 1860s to the late 1880s. He was one of the first photographers to work with the police in Australia, along with Charles Nettleton (Victoria) and Frazer Crawford (South Australia). His Tasmanian prisoner mugshots are among the earliest to survive in public collections, viz. the Queen Victoria Museum and Art Gallery, Launceston; the Tasmanian Museum and Art Gallery, Hobart; the Tasmanian Heritage and Archives Office, Hobart; the Port Arthur Historic Site, Tasman Peninsula; the National Library of Australia, Canberra; and the Mitchell Library, State Library of NSW, Sydney. Thomas J. Nevin's stereographs and portraits are held in public and private collections in Australia, New Zealand, the USA, the United Kingdom, the Netherlands, Denmark, and Switzerland. 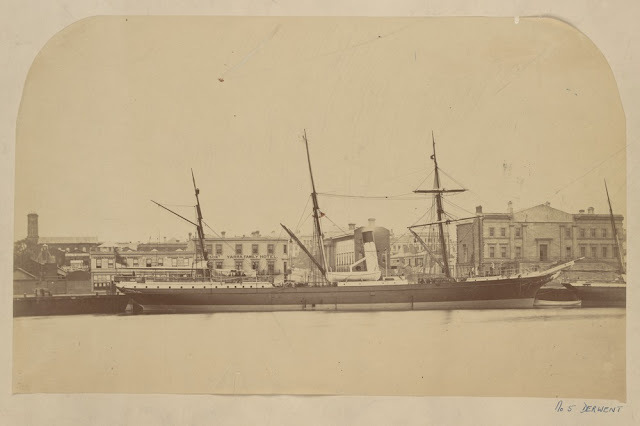 Fourteen years ago (before 2005 actually) we started blogging about Tasmanian photographer Thomas J. Nevin (1842-1923). We look forward to another two years at least as the project draws closer to completion. Contributions and donations are most welcome, and many thanks for your involvement. INDIGENOUS NOTICE: Images on this weblog represent deceased people, including Aboriginal and Torres Strait Islander people. Viewing such images may cause sadness and distress. DISCLAIMER: We have not voluntarily contributed to any publication which supports the misattribution of Nevin's prisoner/convict photographs (300+ extant) to the non-photographer A.H. Boyd, nor do we condone any attempts by public institutions or private individuals to co-opt the work on these Nevin weblogs and associated sites to apply the misattribution. Thomas J. Nevin with stereoscopic viewer and white gloves mid-1860s. KLW NFC Imprint ARR. PC. Click on to visit separate site. Copyright © Thomas J. Nevin |Tasmanian Photographer & KLW NFC Imprint 2003-2019 ARR. All research is original and in press. Theft of our online intellectual property is actionable under the Moral Rights Act 2000, the Digital Agenda Act 2000, and the Digital Millennium Act (USA). Our stats show heavy and repeated downloads pertaining to Nevin's prison photography. Please consult your institution's guidelines on student plagiarism and Amendments to the Copyright Act 2000. Every version of an article and image is printed and stored at the publishers. Take care to consult the URL of the post/article you wish to cite, especially if you are using RSS, caches, and readers as every entry is subject to UPDATING at any time. Do not make hard copies. Librarians please note: do not archive as preserved pages. ALL RIGHTS RESERVED. Copyright © Thomas J. Nevin | Tasmanian Photographer (1842-1923) & KLW NFC Imprint 2003-2019. All enquiries contact administrator.